Birmingham City Council have released a questionnaire on their Future Waste Strategy, asking a range of questions on many issues relating to waste. Birmingham Friends of the Earth believe Birmingham’s waste system is an outrageous waste of resources. An incredible 40% of what goes into Birmingham’s residual waste stream could be composted or digested. Instead it goes up in smoke in the Tyseley Incinerator. 1) Make it easier for people to recycle food waste, by providing a food waste collection and more support for home and community composting. 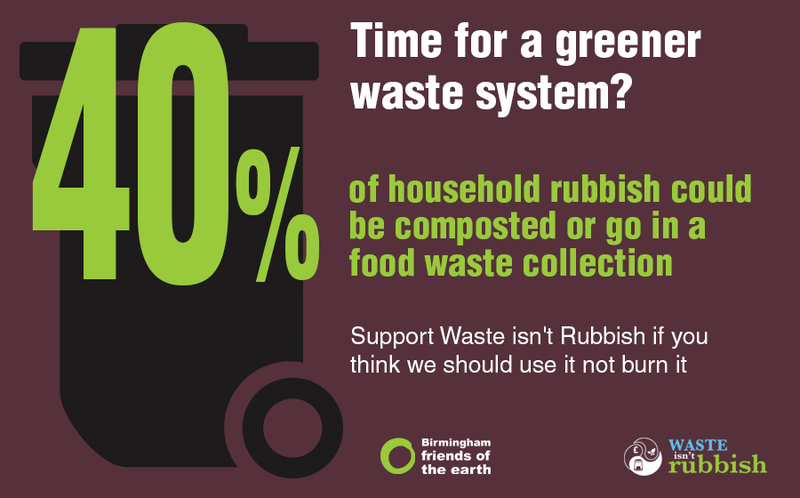 2) Make it easier for people to recycle more types of waste from home. 3) Use local companies to process our waste. We’re asking people to take part in the survey and tell Birmingham City Council that they want a zero waste Birmingham. People can tell Birmingham City Council that they want this greener waste system by answering questions 8, 9, 10, 18, 21, 28 & 29 in the survey. There are a total of 49 questions on the survey, but only question 47 is obligatory. The deadline for the survey is the 6th of January, so there’s not much time left to fill it out!